Tree derived from cytochrome b phylogeny of Steppan (1995a; 1998) and morphology based phylogeny of Steppan (1995b). Systematic investigations in Phyllotis began when Darwin collected two species during the voyage of the Beagle: xanthopygus from eastern Patagonia and darwini from Coquimbo on the central Chilean coast. Its species are frequently the most abundant mammal species at a locality and they have been described as the South American equivalents of Peromyscus, the North american deer mice (Pearson 1958), although they average two to four times the mass. Most species of Phyllotis live in rocky or brushy habitats in the Andes and nearby areas, and they can be found from sea level to about 5000 meters (16,000 feet). Because of their high abundance, their karyology, reproductive biology, morphology, and ecology have been studied to a greater degree than perhaps any other comparable Neotropical rodent group. Phyllotis consists of one widespread and polytypic species, xanthopygus, and 13 other species of much more restricted distributions. Three species are essentially known from only one or a few neighboring localities: gerbillus, definitus, and bonaeriensis. 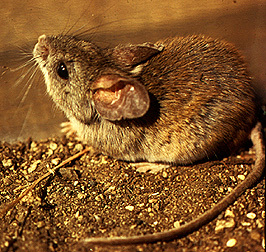 The leaf-eared mice are medium sized (20-100 g), morphologically rather generalized mice. They all have moderate to large ears, and their leaf-like appearance is the basis for the name of the genus and tribe. Molars are simplified relative to most sigmodontines. The absence of many clear diagnostic specializations has made definition of the genus more difficult than for other phyllotine genera. 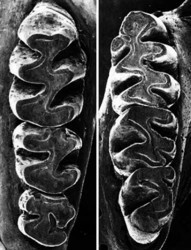 Upper incisors are opisthodont, the rostrum is short to moderate in length, the interorbital region is pinched or hour-glass-shaped, and the cranium is weakly vaulted in lateral view. The fur is relatively long and thick. The upper parts range in color from sand-colored (gerbillus) to a dark ochrous-brown and is closely associated with the amount of vegetation in their habitats. Undersides are typically greyish, but can range from white to buffy. Phyllotis has benefited from two thorough systematic revisions (Pearson, 1958; Hershkovitz, 1964) and two subsequent phylogenetic analyses (Steppan, 1995b; 1998). However, despite those studies and numerous other investigations on related aspects of Phyllotis biology, many phylogenetic issues remain unresolved. The best supported grouping is that of the darwini species group, which is found in morphology-based (Steppan, 1993, 1995b) and mtDNA sequence phylogenies (Steppan 1998). Morphological synapomorphies are largely limited to penile structures: a large distal baculum more than 77% the length of the proximal baculum, hooks on the lateral mounds, and dorsal knobs on the lateral mounds. This very large distal baculum is not found in any other sigmodontine yet surveyed. The placement of caprinus and bonaeriensis relative to other members of the darwini species group is tentative as they were not included in the DNA phylogeny. Phyllotis sensu stricto is supported primarily by a moderate to large distal baculum and a series of more homoplasious characters. A karyotype based hypothesis was proposed by Pearson and Patton (1976) that differed in a variety of ways. A principal difference was in viewing taxa as paraphyletic entities from which other taxa would evolve. The scenario was also guided by Robertsonian fusions as the proposed orthogenetic mechanism for karyotypic evolution in the sigmodontines. Figure 1. Distribution of the fourteen species of Phyllotis. The distributions of P. xanthopygus and P. limatus are combined to simplify viewing. Compare the skulls, jaws, or molars of all phyllotine genera by selecting the appropriate view below. Braun, J. K. 1993. Systematic relationships of the tribe Phyllotini (Muridae: Sigmodontinae) of South America. Oklahoma Museum of Natural History, Norman. Hershkovitz, P. 1962. Evolution of neotropical cricetine rodents (Muridae) with special reference to the phyllotine group. Fieldiana: Zool. 46:1-524. Mann, G. F. 1978. Los pequeños de mamíferos de Chile (marsupiales, quirópteros, edentados y roedores). Guyana (Zoología) 40:1-342. Mares, M. A. 1977. Water balance and other ecological observations on three species of Phyllotis in northwestern Argentina. J. Mamm. 58:514-520. Meserve, P. L. 1981. Trophic relationships and small mammals in a Chilean semiarid thorn scrub community. J. Mamm. 62:304-314. Osgood, W. H. 1943. The mammals of Chile. Field Mus. Nat. Hist., Zool. Ser. 30:1-268. Osgood, W. H. 1947. Cricetine rodents allied to Phyllotis. J. Mamm 28:165-174. Pearson, O. P. 1958. A taxonomic revision of the rodent genus Phyllotis. Univ. Calif. Publ. Zool. 56:391-477. Pearson, O. P. 1975. An outbreak of mice in the coastal desert of Peru. Mammalia 39:375-386. Pearson, O. P., and J. L. Patton. 1976. Relationships among South American phyllotine rodents based on chromosome analysis. J. Mamm. 57:339-350. Pearson, O. P., and C. P. Ralph. 1978. The diversity and abundance of vertebrates along an altitudinal gradient in Peru. Mem. Mus. Hist. Nat. (Lima, Peru) 18:1-97. Pizzimenti, J. J., and R. de Salle. 1980. Dietary and morphometric variation in some Peruvian rodent communities: the effect of feeding strategy on evolution. Biol. J. Linn. Soc. 13:263-285. Simonetti, J. Z., and A. O. Spotorno. 1980. Posicion taxonomica de Phyllotis micropus (Rodentia: Cricetidae). An. Mus. Hist. Nat. Valparaiso 13:285-297. Spotorno, A. E. 1976. Análisis taxonómico de tres especies altiplánicas del género Phyllotis (Rodentia: Cricetidae). An. Mus. Hist. Nat. (Chile) 9:141-161. Spotorno, A. E., and L. I. Walker. 1983. Análisis electroforético de dos especies de Phyllotis en Chile Central y sus híbridos experimentales. Rev. Chil. Hist. Nat. 56:51-59. Spotorno, A. O. 1986. Systematics and evolutionary relationships of Andean phyllotine and akodontine rodents. Ph.D. dissertation, University of California, Berkeley. Steppan, S. J. 1993. Phylogenetic relationships among the Phyllotini (Rodentia: Sigmodontinae) using morphological characters. J. Mamm. Evol. 1:187-213. Steppan, S. J. 1995a. Phylogenetic relationships of the phyllotine rodents (Sigmodontinae) and the evolution of phenotypic patterns of covariation in Phyllotis. Ph.D. dissertation, University of Chicago. Steppan, S.J. 1997. Phylogenetic analysis of phenotypic covariance structure. I. Contrasting results from matrix correlation and Common Principal Component analyses. Evolution. 51(2): 571-586. Steppan, S.J. 1997. Phylogenetic analysis of phenotypic covariance structure. II. Reconstructing matrix evolution. Evolution. 51(2): 587-594. Steppan, S.J. 1998. Phylogenetic relationships and species limits within Phyllotis (Rodentia: Sigmodontinae): concordance between mtDNA sequence and morphology. Journal of Mammalogy. 79(2):573-593. Thomas, O. 1916. On the grouping of some South American Muridae that have been referred to Phyllotis, Euneomys, and Eligmodontia. Ann. Mag. Nat. Hist. 8:139-143. Walker, L. I., A. E. Spotorno, and J. Arrau. 1984. Cytogenetic and reproductive studies of two nominal subspecies of Phyllotis darwini and their experimental hybrids. J. Mamm. 65:220-230. Waterhouse, G. R. 1837. Characters of new species of the genus Mus, from the collection of Mr. Darwin. Proc. Zool. Soc. Lond. 15-21, 27-29. Woodman, N. 1993. The correct gender of mammalian generic names ending in -otis. J. Mamm. 74:544-546. Mammal Species of the World: a Taxonomic and Geographic Reference. Internet version.